Stand up paddleboarding is one of the fastest growing sports in the world. Many of us here at Farr Yacht Design have boards and enjoy a paddle before or after work, so we were excited when Fairweather Paddleboards contacted us to explore developing an unlimited board for the racing circuit. Not long after this we were contacted by Andrew Thompson of Horizon Yacht Charters with interest in developing a 14’ race board which dovetailed nicely with the development work underway for the Fairweather unlimited board. Our sailing yacht designs are focused on achieving the maximum aerodynamic and hydrodynamic efficiency. Similarly, the SUP boards need to maximize the transmission of paddler energy into the board’s motion. Reviewing the marketplace for SUP boards you immediately see how varied the solutions are from different manufacturers and how dramatically they change from year to year. Shapes and sizes vary. Reading the design philosophies for many of the boards can be entertaining, but all too often seem to make claims that don’t seem to stand up to scrutiny. Stability – all things being equal a narrower board has less wetted surface and will be faster. That advantage is lost if you end up swimming too much so the stability needs to be carefully calibrated to the rider. Directional Stability – Bow volume is useful for preventing the bow from digging in, but too high a profile in a cross-wind can knock the bow off course, requiring the paddler to expend energy to compensate. Appropriately sized and placed fins are essential for directional stability. Maneuvering – most races require turns, and this is certainly an influence on the design. For a shorter board (14’ or 12’6”), the paddler needs to be able to shift weight aft, lift the bow out of the water and minimize the turn radius. For the unlimited boards at 17 to 18’ or longer, this is not as feasible, so steering systems need to be considered. 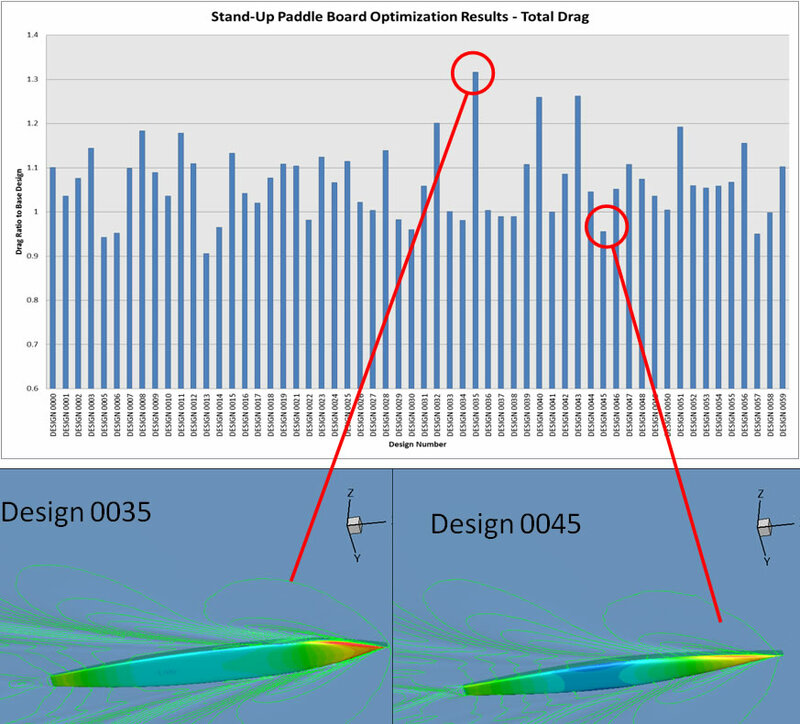 To understand the SUP design space, we developed a parametric model of a board that allowed us to easily make design changes, such as width at various points, rocker curve and rail hardness. This was wired to automatically mesh the designs and run the boards in Fine/Marine, software that shows us hydrodynamic force predictions. Over 100 designs were created in this way with the final design shapes having an advantage of 15 to 20 percent over the reference shapes. For the unlimited size we have a board ~18’ long, 23” wide with a fine entry. The rocker curve is a result of the target volume distribution that achieves the lowest possible wave drag and minimizes wetted surface. At the transom we set the rocker and the subtle “V” in the section to allow the board to pick up stability when needed. It also provides a good planing surface for paddling in waves, allowing the paddler to minimize wetted area by shifting stance slightly forward. 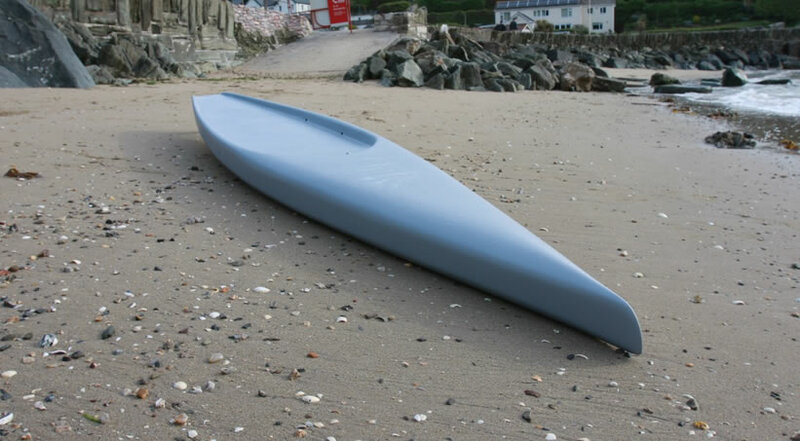 At 14 feet, the flat water board maintains a similar bow styling to the unlimited board, but to achieve sufficient stability, the width is increased to 26”. The rails are a tighter radius, especially aft to assist with buoy turns. The shape shares a similar volume distribution and rocker curve to the unlimited. This maintains the desired combination of low wetted surface and wave drag while still having enough shape to the rocker curve to maximize gains when paddling in waves. Unlike many boards, our designs maintain fullness through to the knuckle so that “effective” waterline length is maintained when paddling in chop but not so much that the board will trip over it. We wanted to create shapes where the paddler can change how the board responds to different conditions by slight shifts in his or her position. The flatter entry and relatively additional rocker in the forebody will provide dynamic lift when surfing in waves but will not carry the same wetted surface penalty. The wave piercing bow is probably the most distinctive feature of the boards compared to many of the latest models. A full bow will be “excited” by the wave encounters (running into the back face of the wave in front). This will slow the board, requiring more energy to get up on the next wave. The wave piercing bow penetrates the wave in front without being dramatically excited and incurring a big drag penalty. It then relies on the buoyancy and shape of the rocker curve in the forward sections to lift the bow up before it begins to dig in. This, combined with a subtle peak along the centerline of the deck, allows the bow to quickly shed water and return to the surface. It’s a fine balancing act to get all aspects to work well together. Initial reports from the 14’ prototypes indicate it is working even better than expected. Hard, almost chine-like rails, are a common feature on many boards. This is one way to maximize stability for the lowest possible wetted surface but this does not account for the drag associated with the vortices shed from the corners. Our shapes, with the much more gradual rails, reflected our flow analysis in this area in an effort to find the right balance between wetted area, rail radius and total drag. Given the requirement for the 14’ board to be able to complete mark turns, the rails harden significantly in the aft portion of the board. On deck, the open cockpit aft, and transom width allow the paddler to freely move aft for the turn. Another way to maximize stability is through cockpit design. Every millimeter that we can lower the paddler, and therefore reduce their center of gravity, translates to an advatage over the same board with a flat deck. Moving the paddlers feet closer to waterline also has the added benefit of decreasing paddle length and increasing stroke efficiency. Any water that does make it into the cockpit quickly drains through the open transom or out one of 4 drainage holes in the sidewall of the cockpit. Unlike the 14’ which is targetting flatwaer and esturary races, the unlimited board is meant as more of an all arounder. We have therefore added a second line defense to keep water out of the cockpit in the form of the wave deflector. The deflector will take any water running along the deck and move it outboard, keeping the cockpit dry. Just as there are a number of go-fast solutions with SUP hull shapes, so too are there a myriad of construction options. At the top of the range, some racing boards are manufactured like high performance racing yachts – formed in female molds, laminated using pre-preg carbon and cured in an oven or autoclave. However most SUPs are manufactured just like their surfboard cousins; by hand-shaping or CNC machining foam blanks from Expanded Polysterene (EPS) foam – the same type of Styrofoam used in disposable coolers! The foam blanks are then covered with layers of E-glass and/or carbon, until a desired strength/stiffness is achieved. There are tradeoffs with each of these production techniques. 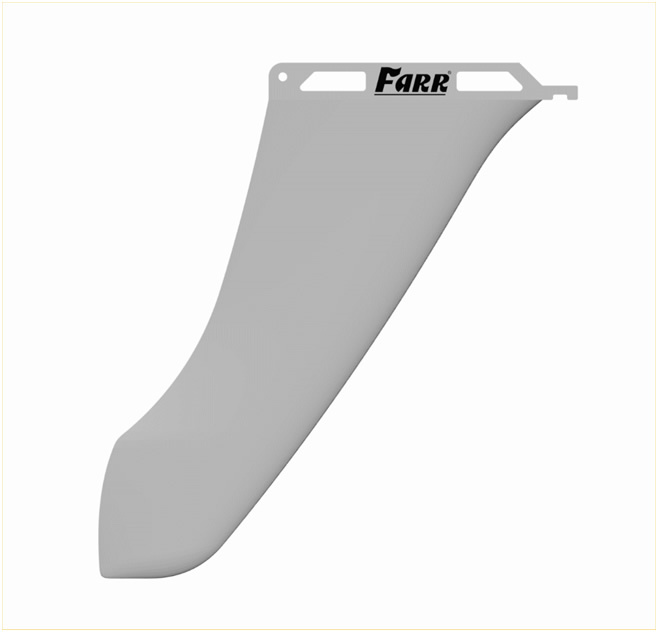 Female molding requires an initial tooling investment, but can quickly produce lightweight, geometrically accurate parts. This is an option that might be attractive for a series-production run. The foam-blank technique is the de-facto standard, but each shape needs to be machined down from a raw rectangular block, and since the laminate is applied over the foam former, fairing is required if the board is to look pristine. The construction timeline for the 14’ prototype was short, requiring a fast & simple construction technique. Female molds would have taken too long to produce, so it was decided early on that the board would be laminated over foam. The EPS foam is available in densities ranging from 11 kg/m3 (0.9 lb/ft3) to 29 kg/m3 (1.8 lb/ft3). Lighter foam is ideal when weight is critical, as is usually the case for racing boards, but since it can be easily dented, the low-density EPS foam requires a heavier skin laminate. The higher density EPS foam is more resistant to indentations caused by feet or knees, but weighs more. The cover laminate can be reduced since the core can assist with dent protection. When determining the laminate for the 14’ board, we considered multiple skin weight and core density combinations. We knew that the weight would be important (target weight of 8.5 kg/19 lbs. without gear), so we focused on a skin laminate that was entirely carbon. We eventually chose medium density EPS foam, which had the right mix of weight and stiffness. From there, we considered laminate materials that would be easily available, and easy to drape over the foam. Once the basic laminate was established, we considered various stiffening methods, and settled on a technique which is relatively common in the yacht design world. The final laminate consisted of a layer of carbon cloth, with overlaps carefully positioned to increase skin thickness in select areas. Additional layers of unidirectional carbon were carefully placed to maximize stiffness, and additional cloth patches were added to thef the leash & fin attachments. The 18’ Unlimited paddleboard required a slightly different approach to the engineering and construction. We initially considered female molds for the board, but since it would likely be a limited production run, the female molds would not have been cost effective, and so it was generally preferred to laminate the board over foam. However due to the additional length and associated volume, it would have been a too heavy to use medium density EPS foam as the entire core/former material. Instead, we engineered a solution which uses low density EPS for the majority of the former, but finishes with a thin layer of medium-density (80kg/m3) PVC/SAN foam. The tougher outer shell of PVC/SAN foam provides the dent resistance, and allows for a lighter carbon skin laminate to be applied over the former. When browsing a catalogue of SUP parts, there are thousands of fin shapes to choose from. Unfortunately most are more art and marketing than science. The general philosophy is to make a shape that “looks cool,” apply a nifty color scheme, make some outrageous claim about stability or drag, and pay for the endorsement of one of the top contenders in the sport. We took a different approach by thinking carefully about all of the functions we want the fin to provide. First we included a generous amount of leading edge sweep to promote weed/kelp shedding. We added extra sweep at the root exclusively for this purpose. Using a convex trailing edge profile at the tip, we locally increased the area of the tip to increase roll stability. A lot of other fin designs feature a concave trailing edge in way of the tip, but it seems counterproductive to add tip area for roll stability and then take it away with a concave trailing edge. We choose an area of 43 in.2 which provides enough directional stability without excessive drag. The fin span is relatively deep to reduce induced drag. 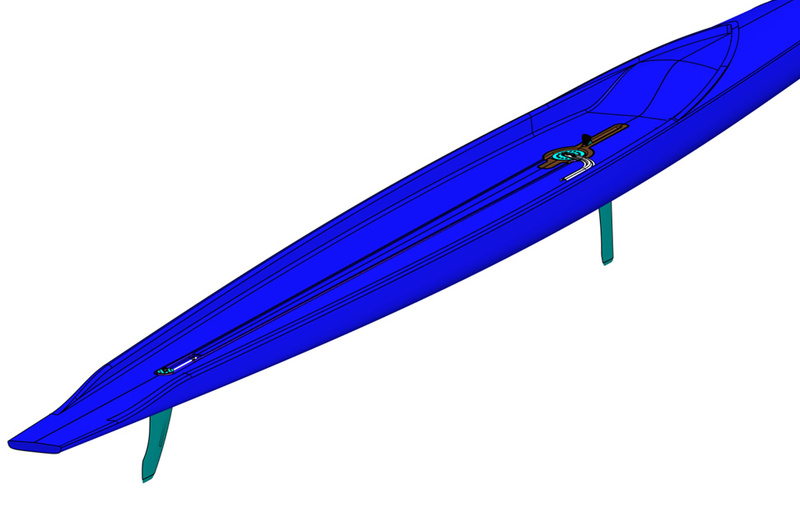 We developed a custom low drag foil section, tailored to the low Reynolds numbers of an SUP. For the unlimited board we felt it would be highly advantageous to have a movable fin. The requirements were that the fin is self-centering but can easily be adjusted by both small and large amounts. For example, small amounts of fin angle are desirable to counter a cross wind whilst still being able to paddle evenly on both sides to avoid rider fatigue. Very large fin angles are desirable to round a mark of the course. To achieve this we developed a nifty quadrant and line based steering system that is adjustable by the paddler’s foot. Where our system stands apart from the rest is that it uses a larger forward quadrant and a smaller aft quadrant to add gearing to the system. This provides more rudder turn per movement of the foot or toe. This is desirable because larger movements of the foot make the SUP unstable in roll. A fiberglass rod is attached to the aft quadrant to center the fin. All of the lines are recessed in the deck and hidden below the deck pad. For the unlimited board we believe it is important to have a forward appendage to prevent sideslip on long legs with signifcant crosswinds. Having a forward appendage to provide this function allows the rider to paddle on both sides and prevent fatigue. However, there are certainly times when this appendage will not be necessary and will create parasitic drag if it is not retracted. Our solution to this is a windsurfing-style centerboard that can be retracted all the way into the hull to get it out of the flow when not required. It is actuated by a knob at deck level which is moved fore/aft by the riders’s foot. The slot in the hull is covered by a gasket to minimise water ingress and maintain a fair canoe body shape. The centerboard is relatively deep to increase roll stability and aid in tracking. The hull slot and trailing edge profile of the centerboard are carefully detailed in sympathy with one another to minimize the amount of water volume in the centerboard slot when the centerboard is retracted. One of our goals at Farr Yacht Design is to constantly seek new work environments where we can exercise our creativity, which will then hopefully spill over into our other more mainstream work. The SUP work across the 18’ unlimited board, and the 14’ racing board has been a great experience for us internally. The unlimited board design for Fairweather Paddle Boards is complete, and the Fairweather’s are currently seeking a partner to prototype the initial board. If anyone reading this article would like to be part of the project I would encourage them to contact the Fairweather’s directly at [email protected]. We are very excited about the potential for this unlimited class project and badly want to see it go ahead. The 14’ board for Andrew Thompson of Horizon Yacht Charters has produced its first prototype, and gone through an extensive sea trialing period. We have been very encouraged by the initial test results against many of the top competitors, and find that our targets have been well validated. We are working to create a refinement of that board that incorporates some minor deck geometry variations, and intend to have a second prototype completed shortly before expanding into initial production. It’s been fantastic to get behind the scenes a bit in this SUP world and to see what a little science can accomplish. We look forward to plenty of paddling this summer.